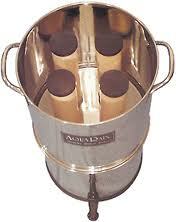 For some time I have been using an AquaRain water filter and have found it to be quite satisfactory. It is an attractive stainless steel unit that is easy to clean and will not harbor bacteria like some porous plastics. It is approximately (assembled) 22 inches tall and 10 inches in diameter. Its approximate shipping weight is 8-9 pounds, including filter elements. It is available in two models: the 200 which uses 2 elements and holds 1 1/2 gallons of water and the 400 which uses 4 elements and holds 3 gallons of water. Its price is comparable to other similar units on the market. I have the AquaRain model 400 which is a double-decker gravity flow water filter that consists of an upper and lower chamber, a lid and four ceramic filters. Simply pour the water into the top chamber and allow the water time to be filtered. In a short period of time, the bottom chamber will fill with pure water, to use simply flip the handle on the tap. One thing that I particularly like about it is that the filter comes with an end of life gauge that tells you when it no longer can be cleaned. As to how effective the filter is the following statement is made by AquaRain. I have been using mine for some time and have no reason to doubt its effectiveness. What do you do when you have a toothache after TEOTWAWKI? Do You Need a Blood Pressure Cuff in Your First Aid Supplies? This entry was posted in medical, water purification and tagged AquaRain water filter, Howard, review, water. Bookmark the permalink. sight guage of some kind? The bottom chamber holds the same amount of water that the top chamber does. You can tell by looking in the top and seeing how much water is left. However you can start using water from the bottom chamber as soon as water will run out the tap.